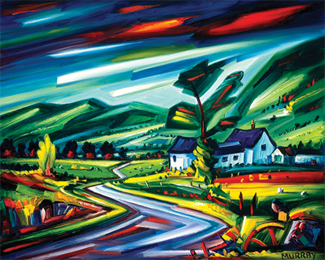 I just love the vibrant colours in Raymond’s paintings, and this picture I especially like becuse it always makes me imagine what’s round the bend in the road . . . perhaps a great tea shop for a coffee and a bun, or a magnificent view, and no doubt some sheep and cattle on the road, me thinks ! Small 230 mm x 184mm or Large 500mm x 400mm. This image is a limited edition of 195 pieces. I live in the US. I think the piece I’m interested is called Winding Road. What a beautiful painting. Is there any way I can purchase this? Thanks for visiting our Blog and finding something by our artists that you like. At present we only supply prints to the USA as “print only”, therefore you would need to arrange to get the print mounted and framed once we shipped the print to you. You can purchase the Winding Road print from our website. You will need to register with our site, this is a security feature and then you will be sent an email to the email address you specified on the registration form. This email contains your “Username” and “Password” and a link to activate your account. All you need to do is select from the drop down menu the size you wish i.e. “Small Print Only” or “Large Print Only”. Since our new website was launched in September 2010, we now deliver to UK, Europe and International. We offer a range of delivery options to cater for all customer requirements. Our delivery costs are calculated based on your delivery address and the total weight of your order, and our delivery charges are based on what our couriers charge. We don’t make money from shipping charges. Our carriers for UK Deliveries are Royal Mail and UPS. For European and International Deliveries we use FedEx.